​The work you and your executive committee are doing is excellent and amazing. In just a few months, your civic association has emerged as one of the most active organizations in Ward 8. And your turnouts are impressive!!! The Anacostia Coordinating (ACC) is proud and honored to have played a role in the restoration of your civic association. Among the future organizational challenges in Bellevue are establishing the Friends of the Lockridge/Bellevue Library and tenant associations in those complexes that have none. I hope that you will be able to put ACC on one of your agendas to discuss those projects. 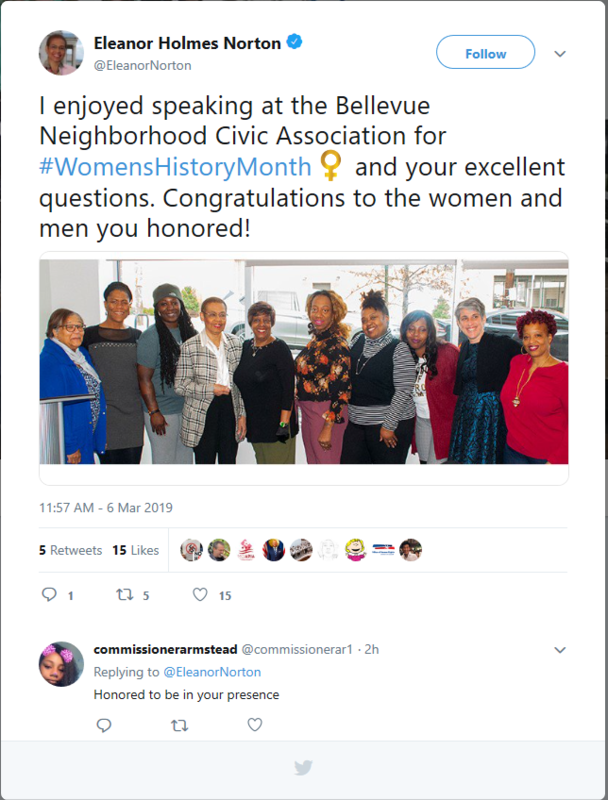 Wanted to share this -- Congresswoman Eleanor Holmes Norton just tweeted about last Saturday's Bellevue Neighborhood Civic Association meeting celebrating Women's History Month! 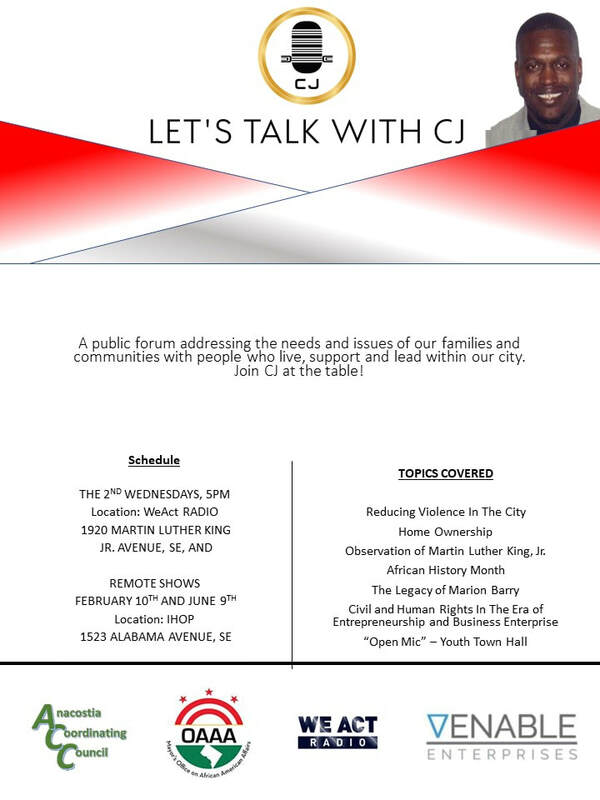 Under a grant from Mayor's Office on African American Affairs (MOAAA) for FY 2019, ACC joins Clarence "CJ" Jackson, III, We Act Radio and Venable Enterprises to present "Let's Talk With CJ", a public forum addressing the needs and issues of our families and communities with people who live, support and lead within our city. Join CJ at the table! ACC is pleased to support this timely and informative project that involves all of us! The purpose of this walking tour map is to identify and document the location and conditions of current and potential access points into Anacostia Park as part of a deliverable for a 100 Resilient Cities project, called Resilient DC, funded by a grant from the Rockefeller Foundation. Coincidentally, this is Year of the Anacostia, a celebration of the 100th anniversary of the designation by Congress as a parcel managed by the National Park Service. Although comparable in size to New York’s Central Park in land area, Anacostia Park, bordering the Anacostia River, is hampered by relatively few entry points accessible to pedestrians, cyclists, and motorized transportation. This tour was conducted by the Resilient DC - 5.5.1 Map Access - Walking Tour Subgroup in order to evaluate park access points with a future goal of increasing and improving access to the park and river. The Subgroup, represented by DC city government agencies, non-governmental organizations (NGOs), non-profits and local business concerns, comprised a group of walkers, cyclists and a car driver. Each group was tasked with covering a sector of Anacostia Park. We, the walkers, covered an area between two large transportation bridges, the 11th Street Bridge and the Sousa Bridge. Because sufficient time was not able to be allotted to configure an ESRI Collector for use on this particular walking tour, a makeshift workaround was devised, with a slight, but acceptable loss of geographic precision. In order to take advantage of higher resolution photos, the walking crew decided to use a digital SLR but non-GPS-enabled camera for ease and flexibility. Therefore, the photos were able to be timestamped but not geotagged. However, in order to capture location information, at each stop along the tour a compass reading from a GPS-enabled smartphone was taken at regular intervals providing longitude and latitude. A screenshot of each reading was captured at each change of location. Offline, when the photos were processed and collated into a data file for inclusion in this walking tour map, photo, location and time information from the various files was compiled, sorted and imported into ArcMap 10.6. Reference point shapefile layers and a DC Orthophoto 2015 made available from DC GIS (http://dcgis.dc.gov) were used to visually confirm, correct and normalize mapping access point locations resulting in an estimated geographic point deviation of +/- 3 meters, which for our purposes, is sufficient to document conditions and locations of interest along the mapping access route. This collection of information serves as the basis for the present walking tour map. Friday, July 20, 2018 was warm, humid and partly cloudy with an average temperature of 89°F. The complete tour lasted approximately from 10:30 a.m. to 4:00 p.m.